In 1963, National Film Board director Léonard Forest travelled from Montreal to the west coast to direct a documentary about artists and poets working in Vancouver and Victoria. Forest said he came here with “zero idea” of what he would find. He made the resulting 27-minute film, In Search of Innocence, with an innocent eye. 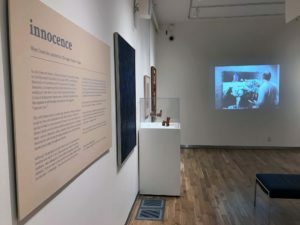 Now, the latest Legacy Gallery exhibit, Innocence: West Coast Art and Artists Through a Visitor’s Eyes pairs the original NFB documentary with work by artists featured in the film — but guest curator Nellie Lamb also examines the notion of innocence as it pertains to the West Coast in the 1960s. 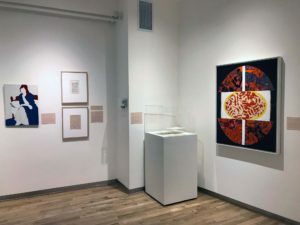 Lamb, a graduate student with the Art History & Visual Studies department, selected work by the likes of Jack Shadbolt, Margaret Peterson, Roy Kiyooka, bill bissett, Joy Long, Sing Lim, Jack Hardman, and former UVic Visual Arts professors Fred Douglas and Donald Jarvis for the exhibit. Curious to learn more? Lamb will be giving a special curator’s talk and tour from 3-4:30pm Saturday, February 3. Douglas was a noted Vancouver artist who eventually joined UVic’s Visual Arts department as a professor. Was there actually a sense of innocence among west coast artists of the 1960s? “I think Forest’s use of the term ‘innocence’ is much more nuanced and nebulous than what we typically use the word to mean,” Lamb explains. Yet Lamb does acknowledge that “the west” has long been seen as a place of opportunity, and that “unrealized opportunity” itself is a type of innocence. Add that to the continued perception that the West Coast is distant from the art-world centers (Europe, New York, Montreal, Toronto), and that West Coast cities like LA and Vancouver are “culturally devoid” compared to their eastern equivalents. 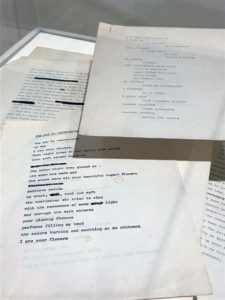 As an AHVS grad student, Lamb says her Legacy exhibit is just one part of a larger research project focusing on documentary film theory, building a history of Vancouver and the West Coast in the 1960s, and considering her own role as audience and curator. Despite the 55-year gap between the NFB documentary and now, when urban growth and development have radically changed both the physical and cultural landscape, Lamb feels some things do remain recognizable. 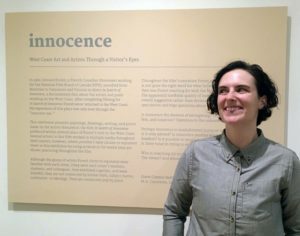 Innocence: West Coast Art and Artists Through a Visitor’s Eyes runs to March 29 at UVic’s Legacy Downtown, 630 Yates (open Wed-Sat, 10-4pm).